Ivy and Bean need some money. Ten dollars, to be exact. Never mind what for. Okay, it's for low-fat Bellideloon cheese in a special just-for-you serving size. Don't ask why. 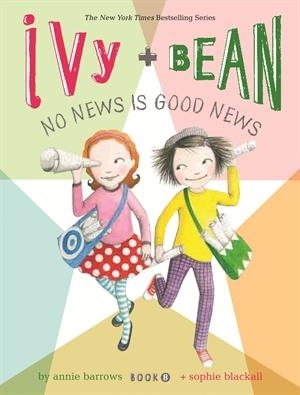 How are Ivy and Bean going to make then dollars! Hey, maybe they should write a newspaper about Pancake Court and sell it. Great idea! And easy, too. All they have to do is snoop around the neighbourhood. Wow. It's very interesting what you can find out. It's even more interesting when the neighbours read about it in the newspaper. 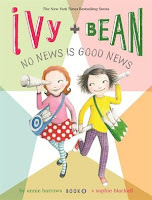 Ivy and Bean is a New York Times best selling series, and this is the first book I have read in the series. The series is aimed at confident younger readers, who don't want a thick novel, and still like to have some pictures. I love the quirkiness of the characters, this whole story is about cheese, low-fat Bellideloon cheese in a just-for you-serving size. Ivy's and Bean's parents won't buy this cheese, because it's expensive, $5.00 for 6 pieces...and the thing is, the girls don't even really want the cheese...they want the red wax, so that they can mould it into things like their friends at school. So, the only way to get he cheese is to buy it themselves and to do that they need money. When Bean's Dad tells the girls he wrote a newspaper for the neighbourhood to raise money when he was a kid, they decide to give it a go. This is where it gets funny. Nothing much happens in Pancake Court, so Ivy and Bean start spying on people through their windows. What they see will make for very entertaining reading...but the neighbours themselves may not be that thrilled to see their private lives on the printed page!